This is an example of how I spend my time. A few days ago I decided that I should sort out all my “scrapbook” type paper so that it would be easier to find and use. I debated for some time about how best to organize and after some deliberation decided to sort by color. Weight, texture and type of paper seem to be secondary in importance the way that I work. Since I had previously purchased clear plastic boxes at Michaels, I was able to start right away. I did an initial sort into color families and then divided further depending on the volume of particular colors. There are several containers of “mixed” with papers that are too colorful to defy classification. Now all I need to figure out is where I’m going to stash them! The trick is finding somewhere convenient, accessible and out of the way. If you’ve seen my studio and annex spaces, you’ll understand my dilemma. 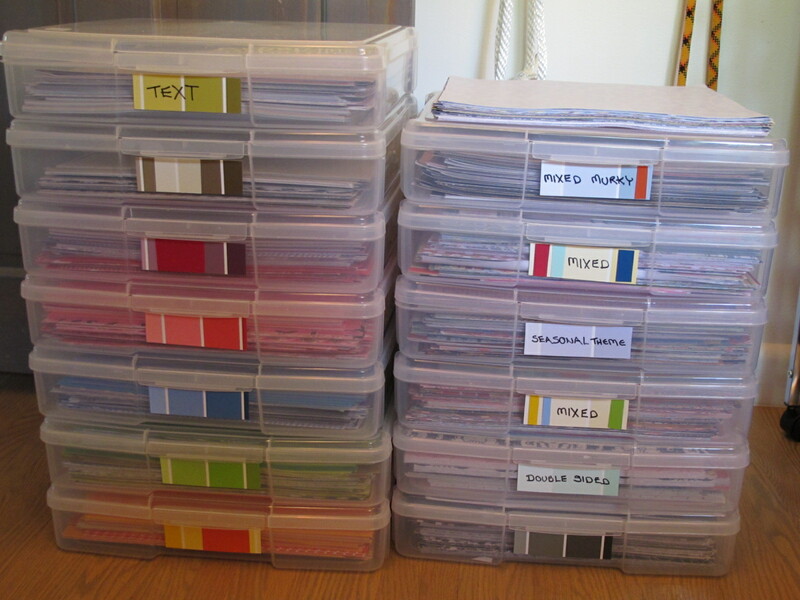 Please note the labels on the boxes – made with one of my favorite paper materials – paint sample cards. I love that you can pick all the pretty colors you want, and that they are free. Hard to beat, don’t you think?